Golden Entertainment bought Stratosphere Las Vegas in December 2017 for $850 million. Las Vegas-based casino and distributed gaming company Golden Entertainment Inc. signed a long term sports betting deal with William Hill US. In the deal, William Hill agreed to manage Golden Entertainment’s sportsbook and racebook operations in Nevada, Montana, and Maryland. The two companies already had a deal in place for Golden Entertainment’s Nevada gaming operations. 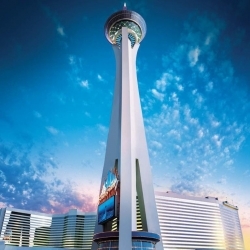 Golden Entertainment owns Stratosphere Las Vegas, as well as three land-based casinos in Pahrump, Nevada. The company also owns roughly 80 tavens and gaming locations throughout Nevada. Under terms of the original deal, William Hill placed deposit kiosks in Golden Entertainment‘s 80 taverns, as well as the Pahrump Nugget Hotel & Gambling Hall. The Edgewater and Colorado Belle casinos in Laughlin also were included in the original contract. The current deal greatly expands the previous venture, so William Hill will control sportsbook and racebook betting at Stratosphere and the various Arizona Charlie’s casinos, including Arizona Charlie’s Decatur and Arizona Charlie’s Boulder. The deal also includes Aquarius Casino Resort in Laughlin, Nevada. William Hill said the deal goes into effect in the first quarter of 2019. William Hill will place a minimum of 100 mobile deposit kiosks at “wholly-owned taverns and third party distributed locations in Nevada” which are owned by Golden Entertainment. Subject to passage of pro-sports betting laws in Maryland and Montana, the two companies will look into the sports betting opportunities in those staes. Golden Entertainment owns the Rocky Gap Casino Resort in Cumberland, Maryland, so it would be a natural place for a William Hill sportsbook, if Maryland legalizes sports betting. Maryland lawmakers introduced a sports betting legalization proposal (House Bill 989) in February 2018. Though the bill never made it onto the floor of the Maryland House of Representatives, the HB989 is an indication Maryland’s lawmakers are considering the proposition. The MGM National Harbor and Maryland Live! are considered successful brick-and-mortar casino operations. MGM Resorts and the Cordish Companies (owners of Live!) can be expected to lobby for the right to house sportsbooks in their casinos. Whether Maryland lawmakers agree that local casino operators need sports betting is another matter, but the deal between William Hill and Golden Entertainment means two more gaming interests will line up behind sports betting expansion in Maryland. Golden Entertainment also owns 300 taverns across Montana. While Montana technically has legalized sports betting, it is a limited form of wagering called “sports lotteries”. A sports lottery includes wagers on 3 or more sporting events (in one bet), much like a parlay bet in horse and dog racing. For Montana sports betting to be worth the investment from William Hill, the state legislature would have to legalize single-game sports betting. The state has approved some forms of gaming in the past few years, with fantasy sports gaming and sports tab games also legal. Blake Sartini began as a 25¢ blackjack dealer at El Cortez Casino in Downtown Las Vegas in 1982. By the turn of the 21st century, Sartini was an executive for Station Casinos, but he left the company in 2001 to build Golden Entertainment. In the 17 years since he founded the company, it has expanded to several US states and has hundreds of distributed gaming venues dotting the American landscape. William Hill is the second-oldest operational British bookmaker, having been started by its namesake in the 1930s. William Hill ran numbers in the 30s and 40s, but the William Hill bookmaker was considered a legit business in the UK by the 1950s. In 1971, William Hill was bought out, which instituted a series of buyouts over the next 35 years. In 2006, William Hill launched its initial public offering (IPO). Playtech, the online casino software developer, eventually took over William Hill’s flagging online gambling brands and, these days, 29% of the company is owned by Playtech. William Hill continues to operate thousands of betting shops in the United Kingdom, though the company has said its US division will become a bigger focus in the near future. William Hill US planned a land-based sportsbook at Monmouth Park in Oceanport, New Jersey in October 2014. The proposed sportsbook brought on a lawsuit from the NFL, MLB, NBA, NHL, and NCAA. That lawsuit led to the landmark May 2018 US Supreme Court decision which struck down PASPA and opened the door to sportsbook legalization in all 50 states. William Hill already operates 108 of Nevada’s 128 sportsbooks and betting shops, so William Hill US is uniquely qualified to help Golden Entertainment become a big player in the US sports gambling scene.